The San Diego Rowing Club Junior Crew (SDRC) youth programs is the leading rowing organization in San Diego for high school and middle school athletes. SDRC has opportunities for high school boys and girls at both varsity and novice level. Our middle school team is co-ed. Our Coaching staff includes national team members and a 2-time gold medal olympian. SDRC rowers practice after school on the beautiful Mission Bay. 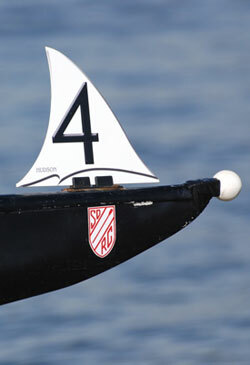 Our fleet includes a variety of boats from 8-person shells to 1-person sculls. Never rowed? Not a problem. Join us for one or all of our learn-to-row camps. Want to learn more about rowing? Click Rowing 101 for more information about the sport. San Diego Rowing Club Juniors program is the leading rowing program for High School and Middle School boys and girls from across San Diego County. Our mission is support and encourage rowing for youth in San Diego by providing young men and women the facilities, equipment and coaching necessary to give them the opportunity to learn the sport of rowing in a safe and fun environment. We want SDRC Junior athletes to be able to train, race and win at the highest levels in a supportive and competitive learning environment where they can develop their leadership and teamwork with commitment, dedication and respect. • Supply challenging and appropriate physical training to achieve maximum development of every athlete to meet individual, team and overall program goals while learning an activity they can continue for a lifetime. San Diego Rowing Club is a 501(c) 3 organization. Donations are always welcome to help to continue the improvements to fleet of boats and our facility. Your contributions are tax deductible.